Edit: Sorry if I broke your margins. I'm trying to implement some type of camera zoom into my project at the moment and I'm having a few issues. I'm working with a tilemap and tilelayer that is 96 tiles by 72 tiles big, each tile is 32x32. When I go to zoom out, my tilelayer compresses, but the camera doesn't seem to adjust and or the full tilemap/tilemap layer are not being rendered. 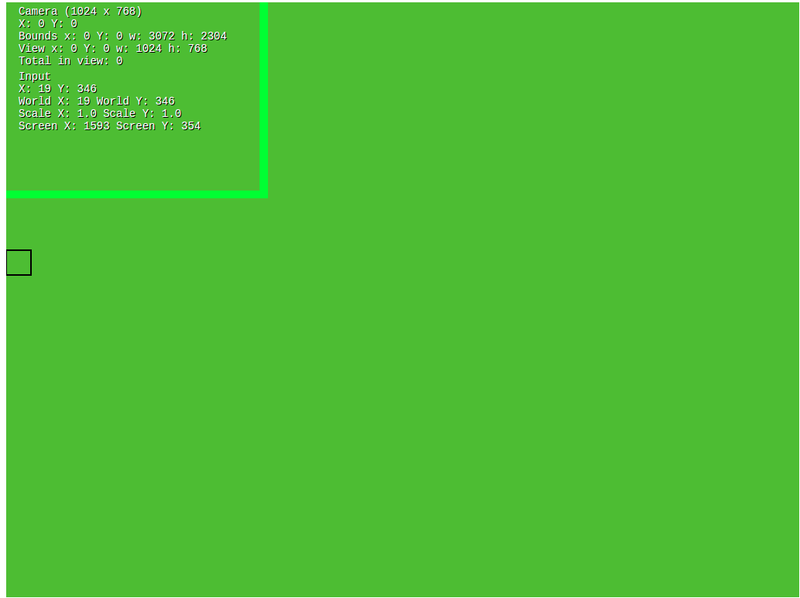 Code looks something like this using lewster32's implementation. Any help would be appreciated and I'll try to reply when I get home from work later tonight. I was having the same problem in my game. I found that using the TilemapLayer resize function solved my problem with the tilemap layer being "cropped" on zoom. As the docs mention, it should be used sparingly as it's an expensive request, but I only call it when the user activates zooming rather than on an update cycle. I haven't noticed any noticeable lag from it, yet. If anyone else knows of a less expensive solution to this problem I'd love to know about it! I've also been having this issue; the function .resize works perfectly well for resizing the browser window and having the content of the tileMapLayer adapt to it, but it doesn't work as it i'd like it too after the scaling that supposed to be a zoom, like the original commenter said. bars are appearing on the sides; this only happens on the zooming event; i'm wondering if this has something to do with cropRect, or the size of the tilemapLayer inside the phaser.game element. For zoom functionality, you should absolutely not scale all of your game objects, input, etc. it's impossible to get it right that way, unless the display list is extremely simple. Instead, resize the renderer. 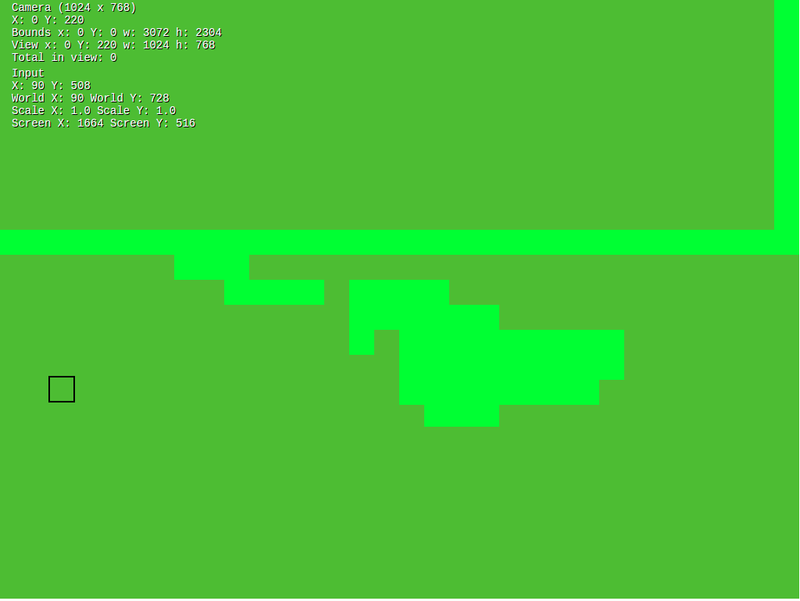 game.renderer.resize. It's that simple! So, how would you go about this? Put it in an update function linked to the zoom key event for example? I'm still looking into this, the above code doesn't work, "this.renderer is not a function"
How do you proceed for zooming @feudalwars? Every time you zoom in or zoom out, you need to update the game, stage, camera and and input dimensions/scale, based on the new renderer size. Note that rendererScale is a global variable updated on zoom. I have a few bells and whistles added, like a minimum world scale of 1 (you can't zoom in further than that), but for the most part, you should be able to copy my code and use directly in your game. Then you can call game.renderer. I've been having problems trying to implement this myself, and Phaser 2 really isn't cut out for it. While your implementation would work, @feudalwars, it also means rendering the scene at a different resolution. This isn't zoom the way it should work, unfortunately. As a consumer of an API, I'd expect game.camera.scale to handle this correctly. Instead, all sorts of things break. Specifically tilemap layer rendering and collisions, and world bounds collisions. That's neat, and produces quality zooming without too much memory use compared to resizing the tilemaplayer each time. I've been trying to implement it on my end and all i'm getting is a scaling of the game window itself. It's been driving me mad, The tilemap doesn't scale, but the game bounds inside the browser are changing on the calling of the tween, and I can't figure out how it works in your example. Would you mind breaking it down a little more? like setting the scaling on a key maybe? gameSize is the original size and never changes. I've managed to implement this fine but there's a few remaining issue that sprung up. Like the OP, this technique makes bars appear on the side of the rendered element when zoomed out, so I call resize on the tileMapLayers every time updateDimensions is called . The problem is that is too expensive as a call, seeing as the zoom feature is for an turnbased strategy game; the player is going to be zooming all the time, and I noticed It makes the display choppy when the tiles become small and phaser is rendering a lot of them: 120*120 ( 14400 tiles). Moving the camera around on the map becomes tedious and choppy. I'm wondering what I can do about that other than limiting the scale factor? The other issue is that I've got a HUD with buttons whose positions are relative to this.game.width and height, so when I scale the renderer, so does the HUD, which isn't wanted. I'm not final on implementing the HUD with phaser and i'm wondering if I could get a plugin to do it for me, but that's not really what I had planned. //  If the game container is resized this function will be called automatically. //  You can use it to align sprites that should be fixed in place and other responsive display things. When the window resizes, it reverts back to the original renderer scale. Any idea on code that would keep the responsiveness? And for HUDs do you use a plugin? then you you get scrolling bars on zoom, it resizes the game area. Something strange I noticed is that if you don't call a specific scalemode and use the zoom then resize the window, the game is suddenly very large and scroll bars appear. How do you handle responsiveness and resizing in your games @samme?